Eco-Audit Grant Recipient: Dina is an inspiration to teachers and students alike at St. Andrew’s Episcopal School (SAS) where she enlivens the classroom experience with her creative, hands-on approach to education. Not only is she teaching two project-based learning (PBL) courses this year, but she’s also the campus Sustainability Coordinator. Dina is also working with three other SAS teachers to expand EcoRise programming, while also using it as a framework for sustainability education schoolwide. In 2016-17, Dina’s students were awarded close to $2,000 in grant funding for nine different solutions to sustainability challenges, including a carpooling app, LED light installations, campus composting bins, low-flow faucets, and an Earth Day education day for 5th graders. Her energy and initiative attract plenty of attention. 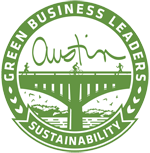 In 2017, St. Andrew’s, part of the National Association of Independent Schools, was named an Austin Green Business Leader by the City of Austin. of students developed an interest in a green career. The most popular choices included engineering, science, and architecture/green building. "I will remember it for the rest of my life. I can design a solution to a problem. They say when you learn things well, you will never forget…and I will never forget what I learned in EcoRise."